Dog treats have evolved greatly from the meaty bones and table scraps that we used to feed our dogs. While you can still find junk food for dogs, there are increasingly more treats available on the market that contain ingredients offering a wide variety of health benefits to your dog. We call these functional treats. Functional dog treats, take treating your dog to another level. Instead of only appealing to your dog’s taste buds, these treats contain vitamins, whole foods, probiotics, immune boosters, antioxidants and amino acids that benefit your dog’s well-being. Functional dog treats can help boost every part of your dog’s body, inside and out with benefits for dental health, calming, skin and coat, joint and mobility, immune and allergy & digestion. • Functional treats are not for the occasional treater. If you only give your dog a treat infrequently, these treats certainly will not hurt, but they are also less likely to help due to the infrequency of feeding. • Do not expect to see a difference immediately. Like taking a vitamin or a supplement, functional treats need to be fed regularly and over a longer period of time before you may see a difference in your dog. Remember every dog is different and some may respond faster or slower than others. • Functional treats are a great way to add in something your dog needs more of in their diet, this is critical for those dog owners who feed their dogs a dry food diet exclusively without any whole food supplementation. • There is such a thing as too much of a good thing. Just because they are healthy does not mean you can let your dog indulge, follow the feeding guidelines suggested by the treat manufacturer and adhere to them. • They come in a variety of styles and flavors from biscuits and soft bites to chews and jerky. If your dog does not like one, you can likely find a flavor texture in another that you can both agree on. • DO NOT rely on functional treats to cure your dog’s ailments. They are a great supplement, not a replacement for regular veterinary care. 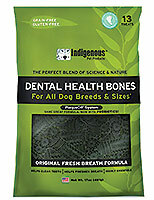 • Indigenous Dental Health Bones help clean teeth, freshen breath, whilst fighting plaque and tartar build up. They are highly digestible for all dog breeds and sizes. Indigenous bones are made with ascophyllum nodosum, a natural kelp harvested from the cold North Atlantic seas of Canada, Iceland and Norway. This kelp is a rich source of nutrients and free from artificial colors and preservatives. • Ark Naturals Brushless Toothpaste is a chewable dental solution for dogs. Highly digestible with flavors of alfalfa, cinnamon, vanilla and clove for freshening breath. Outside ridges provide abrasive action, whilst the toothpaste center helps control tartar, bacteria and plaque. • Ark Naturals Happy Traveler Soft Chews are formulated with high quality botanicals. Happy Traveler was designed by a holistic veterinarian and PHD herbal scientist to ease anxiety and motion sickness. Useful for separation anxiety, travel anxiety, to socialize a nervous or excitable pet in to a new environment, during thunderstorms, fireworks, airline travel, visits to groomers, vets and kennels. • Earth Buddy Pet Hemp Hearts contain organic hemp extract with a potent variety of cannabinoids, terpenes and flavonoids that aid in calming and easing anxiety. These treats include organic hemp extract grown in Colorado with the added benefits of aiding bone and joint health, pain management, antioxidant support, healthy cognitive function and gut health. • Dynamo Dog Hip & Joint soft chews are available in bacon and cheese or chicken flavor. The addition of glucosamine and chondroitin provides a daily measured dose of supplementation to provide healthy joint function. • inClover Research Jump soft chews supply young active with powerful daily joint support. Developed by scientists using evidence based research, one Jump soft chew provides more than 1200 mg of active ingredients balanced to promote joint support and mobility. Glucosamine, MSM, fish oil, coconut oil and natural herbs support healthy joint development, help maintain flexibility and encourage vitality. • K9 Naturals Freeze Dried Lamb Green Tripe contains one ingredient, grass fed green lamb tripe. Packed full of natural probiotics, tripe is the nutrient rich stomach lining of the sheep and green simply means it has not been processed or bleached in any way. Rich in essential fatty acids, omega 3 and 6, green tripe is excellent for dogs with stomach issues but is also excellent for immunity, building muscle, skin and coat support and is low allergenic. 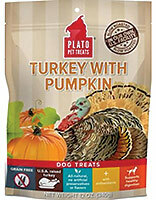 • Plato Turkey and Pumpkin Strips are free of added sugars, artificial preservatives, by-products, artificial colors, protein meals, soy, wheat, corn and junk fillers. A single source protein treat they are especially good at supporting healthy digestion but are also great for dogs with skin issues, allergies and food sensitivities. • Plato Wild Caught Baltic Sprat consists of one ingredient, whole fish. These fish are especially good for dogs with skin issues due to naturally occurring Omega 3 and Omega 6 fatty acids. They are also a great treat for overweight dogs, or dogs with allergies and food sensitivities. • Icelandic+ Capelin Whole Fish dog treats, made from one single ingredient, whole Capelin fish. They are caught fresh daily in the cold, pure waters of Iceland, and air-dried. 100% edible and digestible capelin treats promote healthy skin and coat with Omega-3 fatty acids. They also reduce plaque and tartar build-up, making them good for your dog’s teeth. Plus, since these treats feature a single protein source, they’re a smart choice for dogs with food sensitivities and a great source of taurine for heart health. You see, it’s easy to reward your dog for good behavior (or offer him a snack simply for being so adorable) while at the same time contributing to improved health and vitality!